This oil and acrylic painting illustrates endosymbiosis - one organism living inside another. Featured prominently in the painting are mitochondria and chloroplasts, which are both thought to have evolved over millions of years from bacteria living within other bacteria. The green and purple "eyes" of the figure towards the bottom right represent a single-celled organism called Hatena, discovered by Japanese scientists in 2005. It acquires the ability to photosynthesise by ingesting an algal cell. Here, Hatena is in the process of cell division. Its name come from the Japanese for "how odd". 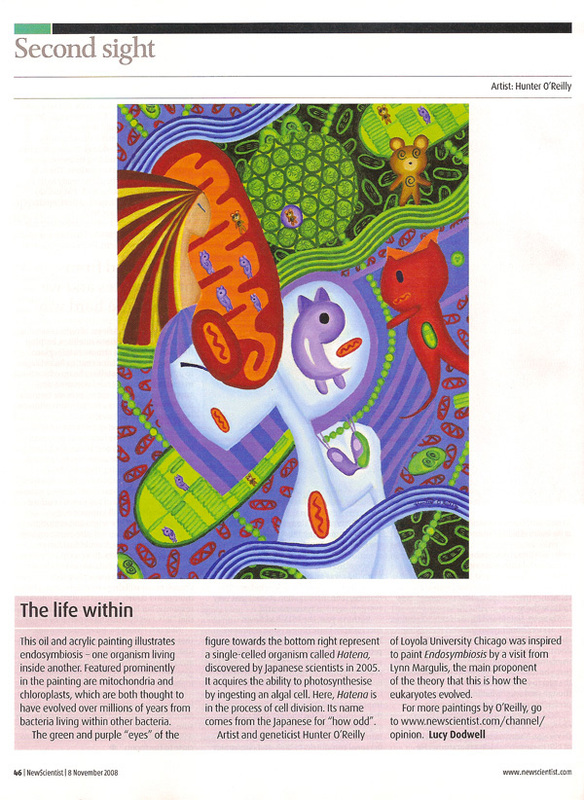 Artist and geneticist Hunter O'Reilly of Loyola University Chicago was inspired to paint Endosymbiosis by a visit from Lynn Margulis, the main proponent of the theory that this is how the eukaryotes evolved.